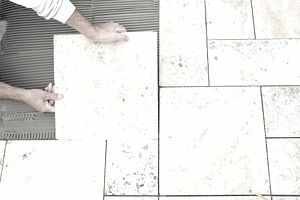 You might be thinking that that floor tile install job looks fairly simple — simple enough that you might be willing to tackle it yourself. Even if you have little experience doing this type of work, you can become something of a professional installer, or at least learn how to install floor tiles like a pro. Read on to understand the process and learn exactly what needs to be done in order to lay down a great looking floor. If you are installing over an existing surface you will need to make sure that the surface is free of any imperfection and clean of debris. Sometimes imperfections can be solved by patching with a waterproof patching compound. If you are installing over wood, make sure that the subfloor is at least 1.5 inches thick. If your subfloor is not that thick, you might want to add a concrete backer board layer to get the right floor thickness. Normally, concrete backer board comes in 1/4" or 1/2" thick. Remove all grease, oil dust, sealer or curing compound by sanding, scraping or chipping away any contaminants. A nice-looking floor tile has to be related to how the layout has been completed and how straight the lines could be. Using chalk lines, snap lines with a 90-degree intersection at the center of the room. Remember sometimes and depending on the room configuration this could not be achieved, and a different approach shall be followed. Follow the layout by installing loose tiles along with their spacers all the way to the walls. Start at the intersection of the chalk lines, and make a path forming a 90-degree angle with tile. If the gap between the last tile and the wall is greater than 1/2 tile then adjust the tiles to one side or another. If the layout is approved by your customer or if you are satisfied, then proceed to the next step. Start by storing your mortar materials at a temperature between 50 to 70 degrees Fahrenheit. Mix the mortar with water until the desired consistency has been obtained, not too watery not too thick. Depending on your mortar mix type, you will need to allow some time for the water to react with the mortar component to obtain the desired result. Remember that the mix should be used within 30 minutes of being mixed with the water. Once you start using that mix, do not add water, as it will weaken and affect the mix strength. Be sure to use the right mortar mix when installing tile over different substrates. The mortar should be applied using the flat side of the trowel first. Then, use the recommended notch trowel apply it at a 45-degree angle, spreading the mortar uniformly. Do continue this pattern but horizontally to maintain the same mortar height. Spread only the amount that can be covered with tiles within the next 15 minutes. Press the tile unto the mortar using a twist motion and hit it with a rubber mallet so it can adhere to the mortar. Let the mortar dry for at least 24 hours and avoid stepping on the tile. Check that lines are uniform and use tile spacers between each tile. The last line to install is the line that has tile that needed to be cut. Remove excess adhesive from tiles. If needed cut the tile with a nipper or wet saw. Use a pencil to mark the area that is to be cut. Avoid using ​the centerpieces of a tile, without any of the factory edges. You don't need to be perfect if a cover will be installed on top of the tile that is about to be cut. Mix grout following manufacturer's recommendations or until a smooth consistency has been achieved. Mix the amount that can be applied in 20 minutes. Mix until all pigments are dispersed and a uniform color has been obtained. Let it stand for five minutes and mix again. Use a grout float to apply the grout into the joints after all spacers have been removed. Use a sponge to remove excess grout. The tile joint can be buffed within 30 minutes of being applied using a dry cloth. For better results seal the grout at least 72 hours after it has been applied. This process will help maintain the color of the grout for more time. This sealer will also reduce the amount of water seeping below the floor tile. Wipe off excess sealer with a dry cloth.